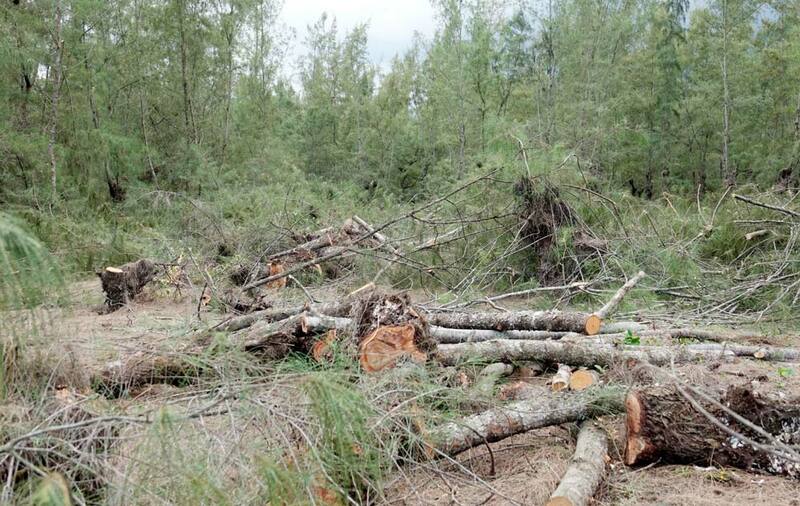 People in Duc Chanh Commune, Mo Duc District, Quang Ngai Province are very pressing and are not sorry, thousands of coastal poplar trees in Village 4 are being cut down. These trees are tens of years old, now only inert, prepared for grading, turned into a vegetable growing. It is not known how the project of growing vegetables but people worry that the coastal "protection" forest, considered as the "green lung" to be cut will affect the lives of the people. At the scene, thousands of decayed willow trees have trees up to 20-30 centimeters in diameter and hundreds of bare trees. At present, the distance from the poplar forest to the coast is just over 200m. When reporters approached to take a picture, one person claimed to be a mining officer who prevented entry. The reason is to ask for permission, while according to the observation zone there is no sign. Seeing strangers, some people are logging wood to stop work and bring saws away. Hundreds of large and small poplar trees fell. 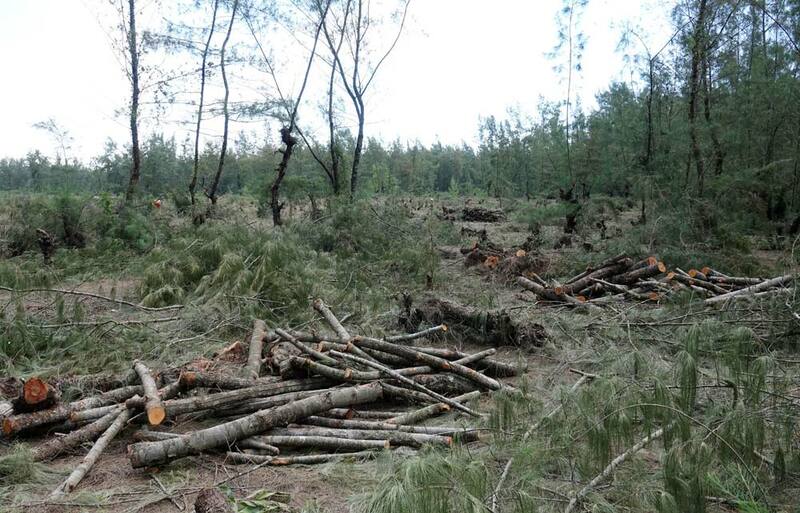 According to the people, the forest was cut down recently was planted about 30-40 years ago with the purpose of breaking waves, blocking sand, rain, storm shelter for the village. Normally people just cut a branch of firewood is also remanded and sanctioned by the commune authorities. However, this time they were "shocked" by the government's intention to cut down the forest area to a few hectares without regret. The population is worried about the long-term consequences of the environment, which directly threaten their lives. Mountainous terrain with no mountain cover outside the sea area is always subject to wind and sand, so the forest is considered as the guardian goddess of the village, especially during the stormy days. The jungle is being cut down for vegetable land. A villager in village 4, Duc Chanh commune expressed: The forest was destroyed, the village lost its natural shield. When there is a big wind, the sand will fly in. The water from the sea will cause many people to grow crops. If people hold meetings, people will never agree. "The willow on the sand planted is so precious. If the economic development that forest encroachment on the sand, then the time of regret is not timely. Growing up in the sand on the sand a few dozen years old so that is not easy "- Mrs. L. in village 4 regret. Also in this village, Mrs B. said: "This is the protection forest and storm protection shield of the people in the village, our people never want to exchange forest for the project of clean vegetables of the commune." Party secretary Duc Chanh Doan Van Bay said that in order to carry out the project of safe vegetable cultivation, local authorities met the people. Based on that, the commune proposes to the district and is given guidelines. The steps are in order. People are worried that this "coastal protection" forest, if cut, will have a negative effect on their lives. However, when the reporter asked to see the minutes of the meeting and the related procedures, Mr. Bay refused, appointing the next day by the commune chairman, the commune vice president attended the meeting, the commune letter is not available. organ. 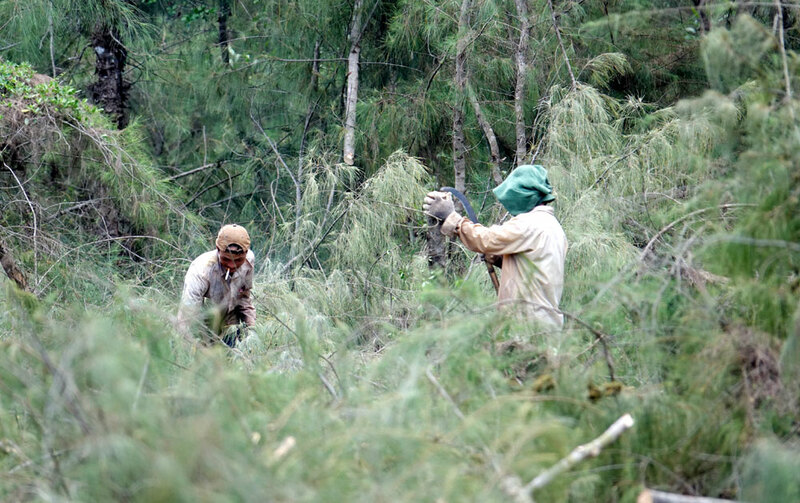 According to Mr. Bay, the area of ​​positive willow forests was cut down 4ha to plan the production of clean vegetables in the production forest. Previously, this area was a protection forest, but from previous years, when there was a business from shrimp farming, it was converted to production forest. "There are about 31 hectares of protection forest converted into production forest. However, due to the remaining area of ​​protection forest "thin", it has moved back to 14.5ha "- Mr. Bay said. Mr. Bay also affirmed that the cut forest area did not affect the people and habitat, because the protective forest belt (from the sea edge) was 210m. "What benefits the people, we do not hesitate to do, not sorry and believe it is effective" - ​​said Bay. Are there repetitions of "falling tracks"
Sharing concerns about whether this repeated failure such as the destruction of more than 12 hectares of former forest for shrimp farming in sand, now many areas of ponds are deserted, Secretary of Duc Chanh commune expressed, model shrimp farming Failure is beyond wish, and this model, believed to be successful. "When the model is successful, the locality will continue to 'eradicate' the area of ​​poplar forest that has been planned for production forests," Bay said. Many stem diameter to 20-30cm. According to Mr. Bay, this confidence is based on the success of the models of vegetable production, small ... of people over the years. As for the issue, Mr. Bay said, the council in Duc Chanh commune in Ho Chi Minh City "promised" will search. Talking to the reporter, Vu Nhan, Vice Chairman of the Mo Duc District People's Committee said that if the vegetables are not planted, will reforestation of economic. "The unit has a project of clean vegetables in the forest area on 17ha, but in the immediate district only 5ha if the effect will be the next 12 hectares," - said Mr. Nhan. Explaining the positive forest for vegetables, Nhan said, the area has trees but not effective, so that hundreds of years still. Now it is necessary to exploit this land for economic development. It is in the right direction of the district and the province allows. About the people do not agree to deforestation, Mr. Nhan said clearly: "What is all the people are local people follow the star. There is no such thing. " According to statistics in 2004, the total area of ​​the coastal area of ​​Duc Chanh commune is about 64ha, of which 31 ha belongs to protection forest. After the Prime Minister's Directive (CT No 38/2005-CT-Ttg) on ​​revising and re-planning 3 types of forest (protection forest, special use forest and production forest), Duc Chanh commune 14.7 hectares of production forest will be added to protection forest. 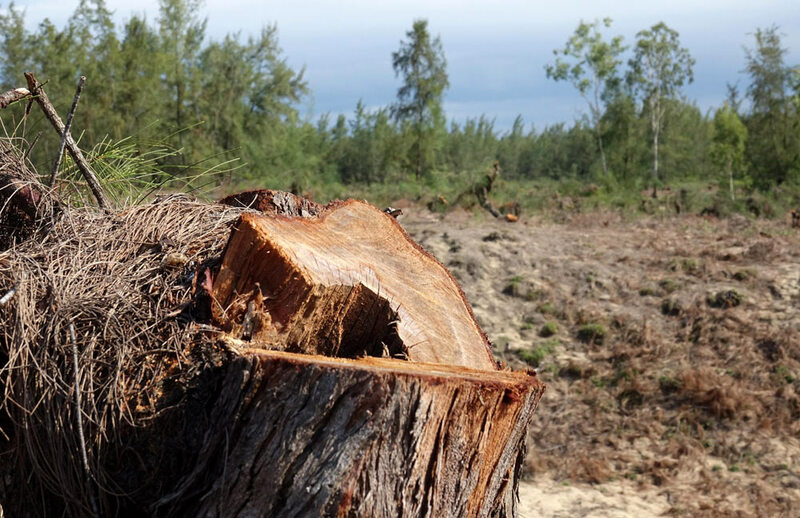 More than 4 hectares of poplar forests are being demolished to plan for the former clean vegetable production areas as well as protection forests, which are then converted into production forests.